Sometimes you just know a particular sporting moment will be remembered forever. 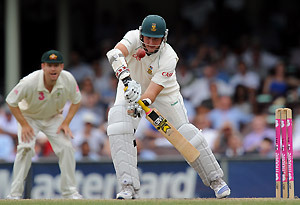 The moment Graeme Smith walked out to bat at the SCG in January 2009 is one of them. 46-years ago, Englishman Colin Cowdrey trudged out against the West Indies with a broken wrist. But he was at the non-strikers end and didn’t have to face any deliveries. No one but Smith will know the pain it took to defend 17 balls with his left hand broken and his right arm numb from injections. It says so much about his character that, having won the series, he still wanted to deny Australia any success. It also says so much about the sport of cricket, which is considered non-contact in theory but not in practice. In the end, a wicked in-swinging delivery by Mitchell Johnson ended the inspirational innings of three runs. As he walked out the Australian players must have been in awe. Of course they would go out and bat with a broken hand and a ball coming at over 140kph, with the very real possibility of being hit in the gloves again. I can’t even run when I have blisters because it’s too sore. But maybe I’ll stop complaining now that I’ve witnessed Graeme Smith’s efforts. It brought back memories of Steve Waugh in the 1997 Ashes series at Old Trafford where he scored two centuries in the match. In the second innings, he virtually batted with one hand because his right hand was badly bruised. Then there are those other amazing stories you read about in sport. I have the FIFA World Cup DVD box set that relives moments in World Cup history. One of them was the Czech goalkeeper Frantisek Planicka, who stayed on the field in 1938, despite breaking his arm! One can only imagine how painful it was for him to even catch an innocuous ball that day, let alone attempt a save. Now, there is another story to add to the list of tough, inspirational sporting moments. Many batsmen have broken fingers over the years, but few are willing to put the team ahead of their own personal well-being. Whatever Graeme Smith does for the rest of his career, the 7th January, 2009, will be remembered as the day he played one of the most unselfish innings ever seen.